Campsite Les Rivages is a campsite with 277 touring pitches. 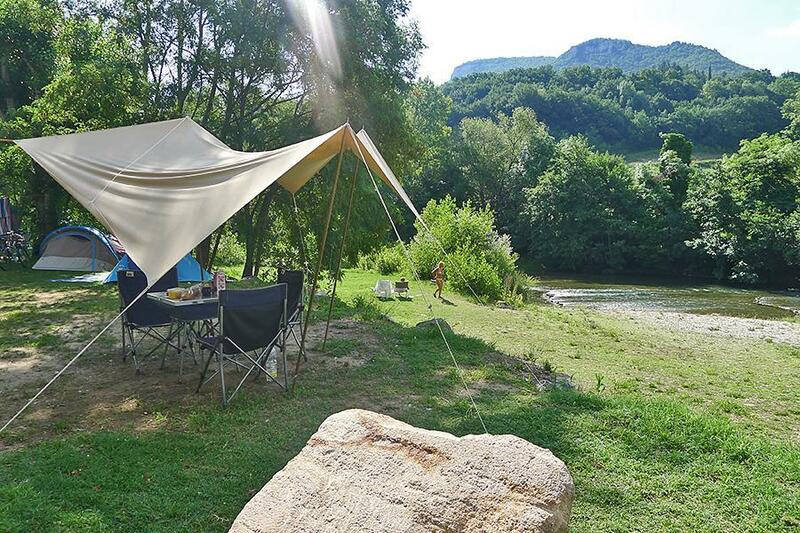 During low season, between 06-04-2019 - 07-07-2019 and 25-08-2019 - 30-09-2019, the nightly rate is €16,- at one of the 277 touring pitches at Campsite Les Rivages in Millau (Aveyron). At this campsite you can not only use your CampingCard ACSI for inexpensive camping, you can also use your ACSI Club ID (as an alternative ID). Magnificent 4-star family campsite. Huge shaded or sunny pitches. Supermarket, restaurant, heated swimming pools; private beach on the banks of the Dourbie. A true natural campsite, an oasis of peace. View of the world famous Millau viaduct. An overnight stop early September on way to Spain. Site was a little scruffy. Toilets needed a good brush out to remove cobwebs but was there at season end. Reception lady refused to accept that ACSI rate included one dog and tbus charged extra. It is the principle that annoyed me more than the cost and thus woukd not return. It is ok but nothing more than that. Great campsite. We stopped for 3 nights in Sept. Facilities were always clean and the pool area excellent. We didn’t have children but if we had there was so much to keep them happy. Cycle way from the site 10 mins takes you into the centre of Millau. Lovely old town and lively bars. We took the boat trip that takes you under the Millau viaduct. Well worth doing.Thoroughly recommend this site. As it states pitches are huge. A good view of the viaduct. Shop wasn\'t open when we were there. But bread etc could be ordered the day before. Supermarket only 5 mins drive. Plenty of shade if required but not so much that were totally under trees. staff very friendly. Bar looked ok but didnt get around to using it. Nice to have soap and toilet paper in the blocks. Nice hot showers and clean. Only stayed 2 nights on way down south. will stay again. Very friendly and helpful. Spoke English Large beautiful pitches near river and view of bridge. Easy walk in to millau. Lovely town. Nearby supermarket excellent. Definitely visit again. The staff at this site where excellent. The pitches where large and well kept. Nice swimming pool with a baby pool and jacuzzi. Restaurant was basic, but fair value. Cycle path at the entrance to campsite, 10 minute cycle ride to Millau. Would highly recommended this site, one of the best we have stayed at. In a lovely area. The second most beautiful site I have visited. Beautiful and massive pitches. Didn't try the food but it didn't look overly expensive. Two pools + a jacuzzi second pool was like 10" deep and great for kids and babies. Staff were brilliant our car broke and they liased with the garage for us on the phone. Stayed for 9 days, which says something. Great choice of pitches, full or part shaded. Great pool. Very helpful staff, who speak far better English, than I can speak French. Easy access to Millau. One tip, at weekends the chalets had some loud youth. Not a great problem, but if you like the quiet, then don't choose a pitch near chalets. Would stay again. It's difficult to fault this site. Choice of pitches from sunny to shady and all of a good size. Staff were friendly and helpful offering plenty of advice. Certainly a site to go back to. This site is excellent. Its location close to Millau town means a 10 minute stroll or a short cycle ride in to a town with many shops and bars. Reception staff were always helpful and spoke English There's a good pool area with lifeguard and organised games during high season Another area to sunbathe is by the river which is shallow and safe. We visited this site 11 years ago and liked it then. Our opinion hasn't changed. Would you like to book Campsite Les Rivages or request more information? You can do both using the information below or by visiting the campsite's website. A75 from north, exit 45 Millau. Exit 47 from south (SatNav off!). Follow 'campsites' signs up to Cureplat bridge. 1st exit D991 on roundabout after bridge. Campsite 800m further at next small roundabout. CampingCard ACSI will send your information request to "Campsite Les Rivages".